Research Shows How Educated Midwives Benefit Women! - Awakening Birth Now! Research Shows How Educated Midwives Benefit Women! The vast majority of midwives in the United States (U.S.) are certified nurse-midwives (CNMs) and certified midwives (CMs). CNMs are licensed and have prescriptive authority in every state. CMs are licensed in five states. 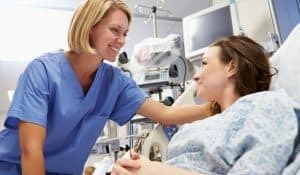 According to the American Midwifery Certification Board, as of January 2012 there are 12,622 CNMs and 73 CMs in the United States (D. Smith, personal communication, January, 2012), and since 1991, the number of midwife-attended births in the United States has more than doubled.1,2 This growth of midwifery has been supported by published research that demonstrates midwifery care is associated with high-quality and is comparable or in some studies, better outcomes than care provided by obstetrician/gynecologists. Recipients of care by midwives report high levels of patient satisfaction, and midwifery care results in lower costs due to fewer unnecessary, invasive, and expensive interventions. Certified nurse-midwives (CNMs) are registered nurses who have graduated from a nurse- midwifery education program accredited by the Accreditation Commission for Midwifery Education (ACME)and have passed a national certification examination to receive the professional designation of certified nurse-midwife. Nurse-midwives have been practicing in the United States since the 1920s. Certified midwives (CMs) are educated in the discipline of midwifery. They earn graduate degrees, meet health and science education requirements, complete a midwifery education program accredited by ACME, and pass the same national certification examination as CNMs to receive the professional designation of CM. Graduates of an ACME-accredited midwifery education program must pass a national certification examination administered by the American Midwifery Certification Board (AMCB) to receive the professional designation of CNM or CM. To maintain the designation of CNM or CM, midwives must be recertified every 5 years through AMCB and meet specific continuing education requirements. What do CNMs and CMs do? Midwifery as practiced by CNMs and CMs encompasses a full range of primary healthcare services for women from adolescence to beyond menopause. These services include primary care, gynecologic and family planning services, preconception care, care during pregnancy, childbirth, and the postpartum period, care of the normal newborn during the first 28 days of life, and treatment of male partners for sexually transmitted infections. These services are provided in diverse settings such as ambulatory care clinics, private offices, community and public health systems, homes, hospitals, and birth centers. CNMs and CMs practice in accord with the Standards for the Practice of Midwifery, as defined by the ACNM. These standards meet or exceed the global competencies and standards for the practice of midwifery as defined by the International Confederation of Midwives. CNMs and CMs work collaboratively with physicians to provide care to suit the unique and individual needs of each woman and her family.